We’ve been fortunate to have some great fans of our latest book for the Republic of Georgia! More so, reviews from both JancisRobinson.com and The Guardian have highly praised the book. 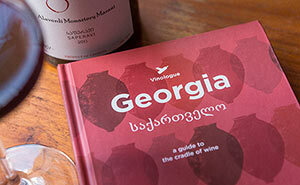 “…an absolute treasure-trove of information that makes it without question the best guide book for any wine lover travelling to Georgia” stated annual book reviewer, Tamlyn Currin in a lengthy review of the book on the website of renown Master of Wine, Jancis Robinson. “…the definitive guide to this unique country’s wines” stated award-winning drinks writer, Henry Jeffreys on his annual round up of wine and drink books for the pre-eminent paper of the UK, The Guardian. All told, were very happy to have received this reviews. Make sure to get your copy today in time for a trip to this wondrous destination!